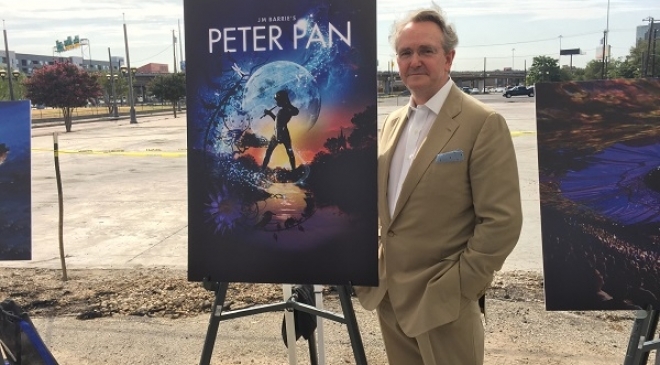 Charles Burnell, founder and executive producer at Threesixty Entertainment, is bringing Peter Pan full circle with a state-of-the art production coming to North Texas November 11 through December 6. When the nonprofit AT&T Performing Arts Center catches up with the London producer, it’s at an empty parking lot which will soon be transformed by a temporary theatre that boasts 12 projectors delivering 360-degree projection, 10 million pixels and 15,000 square feet of CGI. This adaptation of the beloved story uses theatre-in-the-round and 400 square miles of virtual London – projected all around the audience – to immerse theatre-goers in the experience of flying into Neverland and swashbuckling against Captain Hook. The theatre will be set up in downtown in the Dallas Art District, a 100-foot structure that has been everywhere from Kensington Gardens (the inspiration for J.M. Barrie’s first Peter Pan story) to major U.S. cities, but this is the first stop in Dallas. Though the state-of-the-art approach is “jaw-dropping” according to critics, it isn’t the entire reason to come to this adaptation of Peter Pan. Burnell has been producing theatre since 1996, and has an excellent grasp on the crux of great theatre. “The key thing is not to get carried away with any gimmicks,” Burnell says. “What is the story I’m trying to tell? What is the moment I’m trying to deliver and what can I use to deliver that best?” To that end, the story is told with a variety of techniques, from old-fashioned puppetry to high-end technology, which Burrell thinks Barrie would have been a fan of. “Frankly, he was the first person to fly anyone onstage with Peter Pan. He was the first person to put a puppet dog onstage,” Burrell explains. In fact, Burrell tells me, Barrie gifted his native Kirremuir with a sports pavilion, which featured a camera obscura – a telescopic device that uses lights and mirrors to project a 360-degree image onto a table. “I can’t help but think he would love the 360 idea,” Burrell says with a wink. Burell believes that the technological integration isn’t a “new” element of theatre; it’s simply a continuation of people helping to make the theatre experience as powerful as possible. In fact, Burell recalls a time in London when many theatres went dark in the city’s famed West End. “I think live theatre is an organic thing and it lives and dies according to how much a particular generation wants it,” he adds.